Stag beetles are found in Europe and North America. There are 30 different species of stag beetles in the United States. Two-thirds of them live in the western half of the country They are also called "Pinching Bugs" because of their big mandibles. 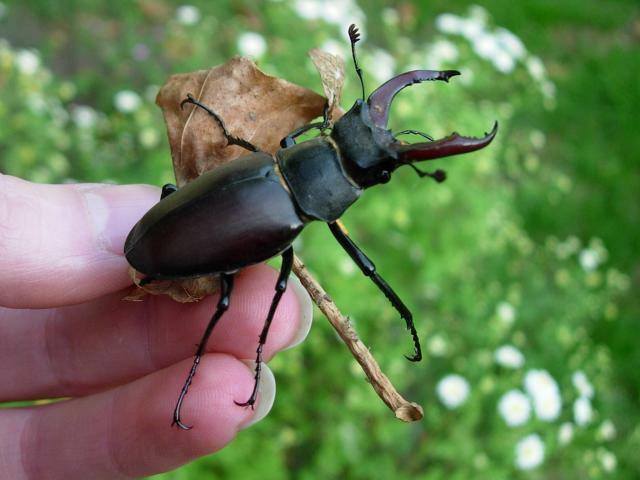 Stag Beetles are large, as you can see from the picture below. The Common Stag Beetle is the second largest beetle, measuring between 22 and 40 mm (or about 1 1/2 inches) in length. The Elephant Stag Beetle is the largest, measuring about 60 mm or about 2 1/3 inches. Like all beetles, stag beetles have "complete" life cycles with four different stages of development (starting with the egg, then the larval stage, pupal and adult stages). Many stag beetle females lay their eggs on or under the bark of dead, fallen trees. When they hatch, the larvae chew their way into the tree and feed on the juices of the decaying wood. Once they complete development (a process which may take several years), the larvae go into the pupal stage while living in small chambers in the soil near their food source. When the adult emerges it searches for a mate. The males in some species of stag beetle use their huge jaws to fight each other over females. Adults live for 1-2 years, depending on the species. (information from the University of Kentucky Department of Entomology). 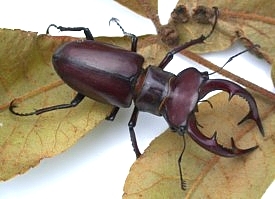 Stag beetles and their larvae are food for a variety of animals, including birds, lizards, snakes, toads, raccoons, centipedes, and weasels and skunks.